I finally have a chance to post a card this weekend. I spent some time cleaning my house and doing laundry yesterday, but finally found a little time last night to make a card. Ahhh....I love stamping :) My reward at the end of the day! Sunday lunch is done (lasagne and corn on the cob). And, I've made to batches of zucchini bread (4 loaves). The first 2 are almost ready to remove from the oven. Mmmm....smells good. Ok. Back to stamping. I found so many great challenges this weekend. 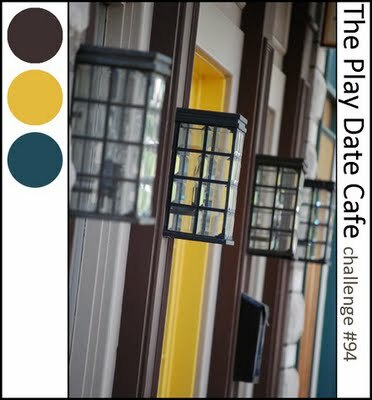 But, the colors over at The Play Date Cafe really drew me in. Take a look at the PDCC94 challenge. SO pretty! Several days ago I saw a gorgeous card on Kalyn Kepner's blog. I knew that I wanted to CASE her card (copy and share everything). And, these colors were just right for the card I wanted to make. You can see Kalyn's card HERE. * You can click on any photo to see a larger version. I used a similar stamp for my card. I changed the colors and sentiment. Also, instead of a border, I drew 3 lines under my focal point. I added a few teal gemstones...then dotted crystal effects on each of the flower buds. This card came together quickly (that's rare for me!) and I really like these colors for a sympathy card. Stunning card Susie! I loved Kalyn's card as well and just adore your take on it! The crystal effects is a real scene stealer! this is an absolutely gorgeous card! i love all of the elements you used. great job! Gorgeous card!! I love the Glossy Accents (wow on the application...I thought you heat embossed it). Beautiful colors! Fantastic texture on those reeds, Susie, and a great use of our colors this week. Love your cards! THanks for playing with us at The PLay Date Cafe! LOVE your card! The embossing and the bling are just lovely and really make the colors look scrumptious! So glad you played at The Play Date Cafe! LOVE that Crystal Effects detailing! This is such a stunning card! Beautiful stamping and overall design! LOVE! Thanks so much for playing along with us this week at The Play Date Cafe! Just gorgeous! I don't think I'd have the patience to put CE on all those little blooms, but it makes for an outstanding presentation! Love the way you added your own touch to the sentiment, too! Wow ... Susie, this is gorgeous ... I really love what you have done with the stamp set - it was my "gotta have stamp set" when it came out, which then quickly turned into the most underused stamp set I own .... might have to dig it out again!! !